14:20-14:50 Andrea Puglisi: An intruder in a granular fluid: from dilute to dense experiments. 14:20-14:50 Maria Rita Fumagalli: Genomic distribution of REs as a result of random placement and neutral evolution of the host genome. 1 Sonia Lombardi: Is causal analysis possible to study sexual selection in the lek? Illustration of the project: participation, grassrooting, crowdsourcing. Porting the Science Cafè method to Internet and to topics beyond science. Cognitive structure in participative engagement. Road Map to inform coordination of research activities and Science Cafes across Europe. Lessons from the Dissemination and Exploitation Workshops based on the results of SciCafe2.0 to engage stakeholders. Random walks have been considered to introduce a dynamics on networks. Random walks simulate different interacting entities (the nodes) which exchange 'particles' according to the topological structure defined by the links. These stochastic dynamical systems can be applied to model complex systems like transportation networks, ecological systems, neural networks, economic systems etc.. In the linear case the statistical properties are defined by the single particles dynamics and the equilibrium distribution depends on the network structure. We introduce non linear effects by assuming a finite transportation capacity of the links or a finite capacity in the nodes. As a consequence the transition probabilities depends on the dynamical state of the network and one cannot derive the statistical properties of the system from the single particle dynamics. We show that the non-linear effects can be described by introducing and entropic force between the node state which allow to derive a master equation for the evolution of the probability distribution of the single node population. The entropic force has a relevant effect on stationary distribution and the relaxation time scale depends on the numerosity of the population so that the thermodynamics limit is non trivial and the lifetime of the transient state is very long. Using numerical simulation we derive an analytical form the the entropic force and we study the dependence of the stationary distribution from the network topology. A central issue of the science of complex systems is the quantitative characterization of complexity. In the present work we address this issue by resorting to information geometry. Actually we propose a constructive way to associate to a - in principle any - network a differentiable object (a Riemannian manifold) whose volume is used to define an entropy. The effectiveness of the latter to measure networks complexity is successfully proved through its capability of detecting a classical phase transition in random graphs, as well as of characterizing small Exponential random graphs, Configuration Model and real networks. Dynamical processes on networks are currently being considered in different domains of cross-disciplinary interest. Reaction-diffusion systems hosted on directed graphs are in particular relevant for their widespread applications, from neuroscience, to computer networks and traffic systems. Due to the peculiar spectrum of the discrete Laplacian operator, homogeneous fixed points can turn unstable, on a directed support, because of the topology of the network, a phenomenon which cannot be induced on undirected graphs. A linear analysis can be performed to single out the conditions that underly the instability. The complete characterization of the patterns, which are eventually attained beyond the linear regime of exponential growth, calls instead for a full non linear treatment. By performing a multiple time scale perturbative calculation, we here derive an effective equation for the non linear evolution of the amplitude of the most unstable mode, close to the threshold of criticality. This is a Stuart-Landau equation whose complex coefficients appear to depend on the topological features of the embedding directed graph. The theory proves adequate versus simulations, as confirmed by operating with a paradigmatic reaction-diffusion model. Several researches carried out in the last 10 years have pinpointed the frequent presence of power laws (Lévy flight or Lévy walks.LF) in animal movement. Here we review briefly available evidence and show that two main non-mutually exclusive hypotheses are available to explain the presence of power law in animal behavior. The first is denoted ‘Lévy flight foraging hypothesis’ LFF and explains the observed patterns as a method used by probabilistic foragers to optimize (maximize) target detection, at low target density. The contrasting hypothesis is denoted ‘free Lévy flight’ FLF and assumes that in most cases this movement pattern arises accidentally by a range of completely different mechanisms, such as responses to the environment, and retsained by natural selection, if useful. We used a biological mpdel at hand to evaluate such hypothesis. Homing studies have proved the remarkable ability of shearwaters (Procellariiformes) to pinpoint their breeding colony after crossing vast expanses of featureless open ocean. It is also well-known that sherawaters have a well developed sense of smell. We developed a mathematical rigorous, and general description of olfactory-cued navigation in the presence of atmospheric turbulence and we showed that a novel type of Lévy flight with a value of the Lévy coefficient of 3/2 is the unique hallmark of olfactory navigation in the presence of atmospheric turbulence. Birds use wind-borne odours, probably dymethil sulphide produced in large amounts by the phytoplankton, to assembly cognitive maps of the seascape to infer their position with respect to the target of interest, such as the colony or rich foraging areas. We tested for compliance with olfactory-cued navigation in the flight patterns of 210 shearwaters of three species in seven colonies (Cory’s shearwaters, Calonectris borealis, North Atlantic Ocean, Scopoli’s shearwaters, C. diomedea Mediterranean Sea, and Cape Verde shearwaters, C. edwardsii, Central Atlantic Ocean) tagged with high-resolution GPS loggers during both incubation and chick rearing. Our analysis provides the strongest evidence yet for cognitive odour map navigation in wild birds. A membrane is a complex object. We focus here on a couple of membrane properties and on their interplay: the bending rigidity (rather than surface tension) and the adhesion to the walls confining it. The resulting dynamics is frozen, with the membrane decomposing in adhesion patches on the two walls. This frozen state exhibits an order-disorder transition when varying the permeability of the walls. If the system is sufficiently perturbed, a transition from frozen dynamics to coarsening may be observed. A simple setup is the occasion for a tour into many issues in non-equilibrium statistical mechanics. In the experiment, a rotating intruder performs a Brownian-like dynamics under the influence of collisions with a shaken granular media. I will focus on our most recent observations: the diffusion properties of the intruder when the granular media approaches jamming (i.e. when density increases and the granular temperature decreases). In this limit, two main phenomena are encountered: a transient dynamical arrest, reminiscent of cages in liquids, and - later - a persistent superdiffusive behavior. Interpretations of these results are given in terms of a multivariate Ornstein-Uhlenbeck model (inspired by the so-called itinerant oscillator of old liquid theories) with "cage inertia" or through a continuous time random walk for the intruder's velocity. Regime shifts in ecosystems can imply relevant economic and social effects. This is especially true when they involve abrupt transitions occurring on a relatively short timescale [1-4]. A special case of regime shift is given by desertification transitions of semi-arid ecosystems which can be strongly affected by climatic or anthropogenic factors [1,3]. A crucial issue in this field concerns the identification of early and reliable transition indicators, providing not only an estimate of the desertification risk, but also a tool to monitor the effectiveness of actions devoted to contrast it [1,3]. To this purpose, several new transition indicators have been proposed [3,4]. In particular, at increasing values of the mortality rate (control parameter of the transition) very early indicators have been recently identified in the case of continuous or nearly continuous transitions (where the order parameter of the transition is the fraction of vegetation covered surface). These new early indicators are associated with a change in the skewness sign of the fluctuation distribution of the size of both the biggest clusters: the vegetation covered and the non-vegetated one . On the other hand, numerical simulations based on a stochastic cellular automaton model [5,6] showed that several physical and ecological parameters, like in particular the colonization rate and the aridity parameter, can affect the character of the transition: from continuous to abrupt or vice versa [6,7]. Here we discuss the possibility of extending the new indicators to the case of abrupt transitions. J. F. Reynolds et al., Science, 316, 847 (2007). K. M. Dahlin, G. P. Asner, C. B. Field, Procs. Nat. Ac. of Science, 110, 6895 (2013). S. Kéfi, V. Guttal, W. A. Brock, S. R. Carpenter, A. M. Ellison, V. N. Livina, D. A. Seekell, M. Scheffer, E. H. van Nes, V. Dakos, PLoS One, 9, e92097 (2014). R. Corrado, A. M. Cherubini, C. Pennetta, Phys. Rev. E, 90, 062705 (2014). S. Kéfi, M. Rietkerk, C. L. Alados, Y. Pueyo, V. P. Papanastasis, A. ElAich, P. C. de Ruiter, Nature, 449, 213 (2007). S. Kéfi, M. Rietkerk, M. van Baalen, M. Loreau, Theor. Popul. Biology, 71, 367 (2007). R. Corrado, A. M. Cherubini, C. Pennetta, Commun. Nonlinear Sci. and Numer. Simulat. 22, 3 (2015). The unprecedented progress in high performance computing we are witnessing today offers the possibility of accurate electron density calculations of systems in realistic physico-chemical conditions. Detailed information of this kind is instrumental not only for ab initio molecular dynamics simulations, but also for a model-independent interpretation of experimental data. In this paper we present a strategy aimed at performing a first-principle computation of the very informative low energy part of the X-ray Absorption Spectroscopy spectrum based on the density functional theory calculation of the electronic potential. This procedure represents a substantial improvement with respect to the more standard approach in which structural fitting and crude muffin-tin-like approximations are used. To test its effectiveness we start in this work by applying the method to the computation of the features of the X-ray Absorption Near Edge Structure part of the XAS spectrum in the paradigmatic, but simple case of Cu(II) in water. In order to keep into account the effect of the metal site structure fluctuations in determining the experimental signal, the theoretical spectrum is evaluated as the average over the computed spectra of a statistically significant number of simulated metal site configurations. The agreement of the theoretical spectrum obtained in this way with the XAS data we recently took at the ERSF facility is excellent. The remarkable success of this approach in the interpretation of XAS data makes us optimistic about the possibility of extending the computational strategy we have outlined to the more interesting case of molecules of biological relevance bound to transition metal ions. In this work we analyze at a structural level the mechanism by which Cu(II) and Zn(II) ions compete for the binding to the A-beta peptides that are involved in the Alzheimer’s disease. We collected X-ray Absorption Spectroscopy data on samples containing A-beta with Cu and Zn at different concentration ratios. We show that the order in which metals are added to the peptide solution matters and that, when Zn is added first, it prevents Cu from binding. On the contrary, when Cu is added first, it does not (completely) prevent Zn binding to A-beta peptides. Our analysis suggests that Cu and Zn ions are coordinated to different numbers of histidine residues according to the relative [ion]:[peptide] concentration. Recent studies reported complex post-transcriptional interplay among targets of a common pool of microRNAs, a class of small non-coding downregulators of gene expression. Behaving as microRNA-sponges, distinct RNA species may compete for binding to microRNAs and coregulate each other in a dose-dependent manner. Although previous studies in cell populations showed competition in vitro, the detailed aspects of this process, most importantly in physiological conditions, remain unclear. We addressed this point with a detailed stochastic model of molecular titration validated by monitoring protein expression of two targets of a common miRNA with quantitative single-cell measurements. The main outcomes of both theoretical predictions and wet-lab experiments are that: (i) the crosstalk between targets is possible only in particular stoichiometric conditions, (ii) a trade-off on the number of microRNA regulatory elements may induce the coexistence of two distinct cell populations, (iii) strong inter-targets correlations can be observed. The application of Crooks' fluctuation theorem to single-molecule experiments has become by now a standard tool to estimate free energy differences associated to the mechanical unfolding of biomolecules. In this talk I'll show a generalization of Crooks' theorem which significantly extends its applicability allowing the study of metastable and misfolded states. Understanding the details of information processing in the brain is one of the most challenging and exciting problems of our time. In this talk, I will introduce the field of spike train analysis and present mathematical tools to measure spike train synchrony. I will focus on time-resolved and parameter-free methods and discuss their properties and advantages. Finally, I will show applications to experimental and numerical results and provide perspective for future advancements. Transient neural synchrony of groups of neurons underlies processing of presented stimuli. Neuron populations tend to code the input information in groups. There could be many approaches in deducing such groups, however some are shown to be promising since they do not require any parameters, neither any prior knowledge of stimuli.In a 'as realistic as possible' setup different stimuli are presented repeatedly and responses in spike activity are generated. If some neurons are coding (even partially) their group activity can be a fingerprint for the stimulus they have been coding. The main focus will be on methods that are capable of automatic extraction of those fingerprints. It is also important to be robust to a number of neurons, that the method should cover various realistic scenari, from individual neurons to large neuronal populations. The algorithm presented fulfills all criterias to do this kind of tasks.Since the algorithm used in this setup relies on pairwise distances, the brute force calculation is limited to a rather small number of neurons. However, the algorithm relies on an iterative scheme which considerably restricts the number of subpopulations for which the pairwise distance matrices and the stimulus discrimination performance actually have to be calculated. In order to evaluate whether the responses elicited by different stimuli can be distinguished, the algorithm uses the SPIKE-distance (Kreuz et al. 2013) which is parameter-free and time-scale independent. This allows for easy comparability of results obtained for vastly different firing rates (which depend on the size of the pooled subpopulation). Recent research is accumulating growing evidence that certain properties of the environment are key to the the stunning quantum efficiency displayed by photosynthetic complexes in different organisms. In particular, evidence has been presented that protein scaffolds are characterized by specific vibrations that couple to exciton dynamics, with the effect of promoting efficient energy transfer. In this talk, I will illustrate an original approach building on a semiclassical model of antenna complexes, where the quantum excitation is coupled to an explicit nonlinear coarse-grained network model of the protein matrix. I will illustrate this approach with reference to different systems and simulation protocols. Antibodies are large, extremely flexible molecules, whose internal dynamics is certainly the key to their astounding ability to bind antigens of all sizes, from small hormones to giant viruses. In this work, we build a shape-based coarse-grained model of IgG molecules and show that it can be used to generate 3D conformations in agreement with single-molecule Cryo-ET data. Furthermore, we elaborate a theoretical model that can be solved to any desired accuracy to compute the binding rate constant of a small antigen to an IgG in a prescribed 3D conformation. Our model shows that the antigen binding process is tightly related to the internal dynamics of the IgG. We find that such link is more complex the more important are non-specific interactions with sites far from the paratopes. Our findings pave the way for further investigations of the subtle connection between the dynamics and the function of large, flexible multi-valent molecular machines. Retrotransposable elements (REs) are DNA sequences capable of creating copies of themselves and proliferate within a host genome. The two main human REs families, Alu and L1, compose about 30% of our genome and comprise more than one millions of elements divided into tens of subfamilies. The proliferation dynamics of these subfamilies is typically characterized by rapid bursts of amplification followed by inactivation. Thus, most of the REs detectable in human DNA are inactive sequences and their distribution keeps trace of the evolutionary rearrangements of the host genome after inactivation. A comparison between inter-RE distances and the expected distribution for a random-placement model as a function of time suggests that genome evolutionary mechanisms have both increased the clustering of REs and fostered the presence of very distant elements. According to our model, the distributions along the human genome of Alus and L1s can be well described as a stochastic process of random placement followed by genome expansion and segmental duplications. The analytical solution of this process can well explain the empirical distributions of different REs subfamilies in human, while an expansion-elimination model is not sufficient to reproduce the data. I would like to review our recent progress in the development and application of a unified theoretical framework to predict the time evolution of atomic nuclei and electronic excitation in biomolecular systems undergoing rare transitions. We study the emergence of altruistic behaviour in collective games. In particular, we take into account Toral’s version of collective Parrondo’s paradoxical games, in which the redistribution of capital between agents, who can play different strategies, creates a positive trend of increasing capital. In this framework, we insert two categories of players, altruistic and selfish ones, and see how they interact and how their capital evolves. More in detail, we analyse the positive effects of altruistic behaviour, but we also point out how selfish players take advantage of that situation. The general result is that altruistic behaviour is discouraged, because selfish players get richer while altruistic ones get poorer. We also consider a smarter way of being altruistic, based on reputation, called ‘‘selective altruism’’, which prevents selfish players from taking advantage of altruistic ones. In this new situation it is altruism, and not selfishness, to be encouraged and stabilized. Finally, we introduce a mechanism of imitation between players and study how it influences the composition of the population of both altruistic and selfish players as a function of time for different initial conditions and network topologies adopted. In this presentation, I provide an overview of the research activities carried out by our group at the DREAMS Laboratory in Pisa (dreamslab.sns.it). In particular, computational methods and applications suited for modeling complex systems in the soft condensed matter will be briefly described by selecting illustrative examples from recent studies. In this context, I also report on recent developments of the General Liquid Optimized Boundary (GLOB)1-4 model, which is a discrete-continuum molecular dynamics method well suited to treat complex systems at different level of theory, from purely quantum-mechanics to hybrid QM/MM methods and classical force fields, including polarizable force fields. Brancato, G.; Rega, N.; Barone, V., A hybrid explicit/implicit solvation method for first-principle molecular dynamics simulations, J. Chem. Phys. 2008, 128, 144501. Brancato, G.; Rega, N.; Barone, V., Molecular dynamics simulations in a NpT ensemble using non-periodic boundary conditions, Chem. Phys. Lett. 2009, 483, 177. Brancato G.; Rega N., Computational spectroscopy by classical time-dependent approaches, Chapter in COMPUTATIONAL STRATEGIES FOR SPECTROSCOPY: From Small Molecules To Nano Systems, pp. 517-547, editor V. Barone, Wiley and Sons, New York (2011). Mancini G.; Brancato G.; Barone V., Combining the Fluctuating Charge Method, Non-Periodic Boundary Conditions and Meta-Dynamics: Aqua Ions as Case Studies, J. Chem. Theory Comput. 2014, 10, 1150.
of individual cells. We find that in this parameter range, the network displays an input-specific sequence of cell assembly switching, and can optimally discriminate between similar inputs. Our results support the proposal [Ponzi and Wickens, PLoS Comp Biol 9 (2013) e1002954] that striatal network topology is set up to allow stimulus-selective, temporally-extended sequential activation of cell assemblies. Facebook is a social institution for many teenagers that can be used by them for self-presenting. Analyzing the contents of a personal profile gives the possibility to detect the dynamics and the social-psychological behaviors within the social networks. This study aimed to explore the syntactic and usage features of online interactions in an Italian sample of adolescent in order to define a new model, labeled “Excessive online self-presentation model”, and to assess this tendency, through the linguistic analysis of public contents of personal pages. In this study we collected one year of Facebook activities from 50 participants. Results described how an excessive self-presentation consists of disclosing lots of information to online friends, highlighted by the presence of a higher number of words per posts, suggesting a strategic use of language, and stating a large use of sexual language, supporting an attention-seeking behaviors. Findings extend prior research dynamic features and content differences in online self-presentation and confirm how the linguistic analysis is a useful tool to investigate the self-presentation in social networks. Within probabilistic reasoning, many biases and judgment errors are explained in terms of representativeness heuristic. Bayesian modeling and quantum cognition represent two attempts to provide a formal description of this heuristic. In order to explain representativeness-based errors, the Bayesian approach makes strong assumptions about the constraints that modulate subjective probabilities. Recently, it was shown that the quantum cognition approach can account the use of representativeness heuristic in human judgements. This work aims to study human judgements concerning the Bell’s inequality, which is a mathematical property that plays a central role in quantum probability theory. A quantum model able to account the use of representativeness heuristic in a task based on Bell's inequality was developed. Participants were presented with two different scenarios and two modalities of response (forced choice and probability rating). Results confirm the predictions of the proposed quantum model. Instead, the Bayesian approach was unable to account for the participants’ judgments without making ad hoc assumptions. electrophysiological signals recorded in different experimental conditions. In particular, we were interested to investigate the overall electrical activity of an assembly of neurons reflected by Local Field Potential (LFP) recordings. We focused on three experimental conditions for animal model (mice) that are relevant for theoretical neuroscience and preclinical studies: Environmental enrichment (EE), Photothrombotic Stroke (PS) and Standard Condition (SC). Briefly, EE is an experimental protocol based on a complex sensorimotor stimulation that dramatically affects brain development, PS is an induced focal ischemia that reproduces in an animal model the effects of stroke in humans and SC is a control condition. Several methods from linear and nonlinear time series analysis theory, each one highlighting different aspects of brain dynamics, were used to study these signals . Rhythmic brain activities were characterized by spectral analysis (power bands). Statistical correlation between different brain regions were quantified through cross correlation, mutual information and detrended cross correlation analysis, whereas their causal relationship were assessed by means of Granger causality analysis. Finally, scale-free properties of LFP recordings were discovered and quantified using an integrated approach composed by three independent techniques: power spectrum, fractal dimension and detrended fluctuation analysis. Our work highlight the fundamental role of nonlinear time series analysis theory in understanding the complex dynamics generated by the brain. Sonia Lombardi: Is causal analysis possible to study sexual selection in the lek? Sexual selection is a fundamental evolutionary force which operates (i) through competition between individuals for access to breeding partners and (ii) through female mate selection, leading to the evolution of exagerated ornamentation in males which are used to prove their genetic quality (Darwin,1871). Fallow deer (Dama dama) can use an alternative mating strategy, the lek breeding where many males and females congregate in a small area for mating for fierce competition. Typically behavioural scientists observe how many copulation each male is able to obtain in the lek and correlate it to male phenotypic morphological, functional and behavioural traits to investigate which factors promote copulatory success. We reviewed the principal statistical methods which have been used and we pinpoint their weaknesses and limitations. Meta-analysis of principal papers on reproductive success shows a recurrence use of the multivariate regression model but this method may erase the existing correlations between variables, distorting the result. The main statistical problems are: (i) strong correlations between variables; (ii) probably presence of spurious correlation between variables; (iii) non-normal distribution of variable response (copulatory success). We approach to the problem with a cross-sectional data analyses of lekking fallow deer. Data have been collected in the population of fallow deer of the Preserve of Castelporziano (Rome, Italy) during the rut within the lekking area. We studied the causal factors explaining the differences in mating success, using Generalized Structural Equation Models (GSEM) with a pdf Zero Inflated Poisson (ZIP) for copulations. A total of 10 behavioural variables (dominance, reproductive success, harem size, lek attendance, antlers shape and asymmetry) were used in the statistical analysis. We developed two a priori models to test two principal hypothesis: female choice in which we assumed that females preferred a male for its good genes; male dominance in which we assumed that copulatory success is depending on bucks’ dominance rank. Model comparison and analysis of the models’ fitting showed that the female choice model better explains the observed covariance patterns. We recommend the use of GSEM as possibility to test different working hypotheses about breeding behaviour of fallow deer using categorical variables, to estimate direct and indirect causal effects using variance-covariance matrix of the empirical data. For this motivated reason previous works should be revisited using statistical models which minimize the parameters estimate error. Giovanna Pacini: Science on air: RadioMoka! Science and Technology topics are more and more capturing the interest of the large public. Space missions, nuclear reactors and the human nutrition strategies are examples of subjects that are attracting the interest of citizens belonging to very different cultural background. Traditional media such as televisions or newspaper may not always be the best solution to let the academic doors open for the dissemination of such results to the generic public. Indeed only few television or radio programs are devoted to the dissemination of science in Italy and, more particularly, in Tuscany. To improve this aspect, at least at a local level, we started to produce a scientific radio program named RadioMoka. The program, now at its 6th Season, is aired every Saturdays at 11 a.m with a replica every Sundays at 10.00 a.m. on Novaradio Città Futura. It was fully designed and realized by the authors of this work, both for what concerns the 'making of' of the episodes and the editing process. Since the program is not live, we produced a survey to understand the feeling and expectation of the public, with encouraging results. In this work we integrate existing soil infiltration modeling with particle based methods in order to simulate landslides triggered by rainfall. 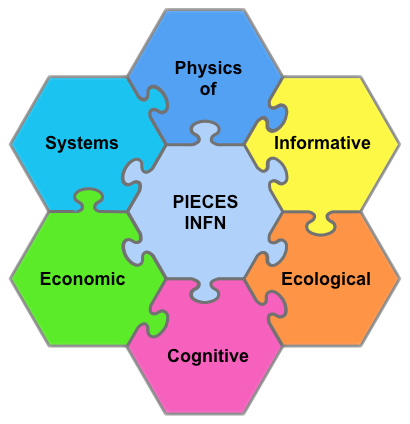 In literature, usually, the infiltration models are based on continuum schemes (e.g. Eulerian approach) by means of which it is possible to define the field of the pore pressure within a soil. Differently, the particle based method implements a Lagrangian scheme which allows to follow the trajectory of the particles and their dynamical properties. In order to simulate the triggering mechanism, we test the classical and fractional Richards equations adapted to the molecular dynamics approach using the failure criterion of Mohr-Coulomb. In our scheme the local positive pure pressures are simply interpreted as a perturbation of the rest state of each grain, i.e., the pore pressure function can be interpreted as a time-space dependent scalar field acting on the particles. To initialize the system we generate, using a molecular dynamics based algorithm, a mechanically stable sphere packing simulating a consolidate soil. In this way we obtain the input structure of our "fictitious" soil to model landslides, considering the infiltration processes caused by rainfall. Moreover, in our scheme, the particles are porous and therefore we take into consideration the micro pore structure at intra-particle level, while the macro pore structure is due to inter-particle interstices. In this way we have two different infiltration time scales, as observed experimentally. The inter-particle interactions are modeled through a force which, in the absence of suitable experimental data and due to the arbitrariness of the grain dimension, is derived from a Lennard-Jones like potential. For the prediction of the particle positions, after and during a rainfall, we use a standard molecular dynamics approach. We analyze the sensitivity of the models by varying some parameters (hydraulic conductivity, cohesion, slope and friction angle, soil depth, variation of random properties, fractional order of the generalized infiltration model, etc.) and considering both regular and random configuration of the particles. The outcome of the simulations is quite satisfactory and therefore, we can claim that this is a promising new method to simulate landslides triggered by rainfall. Systems with long-range interactions display a short-time relaxation towards quasistationary states (QSS) whose lifetime increases with the system size. In the paradigmatic Hamiltonian mean-field model (HMF) out-of-equilibrium phase transitions are predicted and numerically detected which separate homogeneous (zero magnetization) and inhomogeneous (nonzero magnetization) QSS. In the former regime, the velocity distribution presents two large, symmetric, bumps, which cannot be self-consistently explained by resorting to the conventional Lynden-Bell maximum entropy approach. To improve the theory in this respect and eventually fill the gap with the observation, we here propose a generalized maximum entropy scheme which accounts for the pseudo-conservation of a additional charges, the even momenta of the single particle distribution. These latter are set to the asymptotic values, as estimated by direct integration of the underlying Vlasov equation, which formally holds in the thermodynamic limit. Methodologically, we operate in the framework of generalized Gibbs ensemble, as sometimes defined in statistical quantum mechanics, which contains an infinite number of conserved charges. The agreement between theory and simulations is extremely satisfying, both above and below the out of equilibrium transition threshold. The fine details of the velocity profile are adequately captured upon truncation at the tenth order in the hierarchy of pseudo-conserved momenta. Abstract: Synchronization is one of the most surprising phenomena that occurs in systems of coupled oscillators. A system is synchronized if its individual elements show a common or a temporal correlated evolution and therefore a coherent collective dynamics, which largely depends on the interactions structure of the system, on its individual elements and on their coupling. Synchronization is a universal phenomenon, which appears in systems belonging to various research fields and particularly in the brain tissue, which can be modelled through neural networks. A neural network is a dynamic system built on a graph, whose nodes are occupied by individual oscillators (neurons), and whose links represent their synapses. These neural systems can reproduce the synchronous phases that are experimentally observed and that in brain tissues are linked, depending on the cerebral area in which they occur, with cognitive processes, such as memory, or malfunction phases.In the present work we want to see how synchronization properties of a neural network change if the interactions structure of the system is modified, especially if some nodes with a very high number of connections (hubs) are present and if we take into account both the excitatory and inhibitory mechanisms. The starting idea is based on a recent study (P. Bonifazi and et al., Science, 326(5958):1419–1424, December 2009), which from analysis of electrical activity in some cerebral areas of mice proves the existence of population of inhibitory hubs nodes, which carry out a regulatory function for the whole system. stochastic protocol involving an effective interaction among a large subset of particles.